FastTEST Pro is designed to meet the needs of organizations that need to administer secure computerized tests in one or more specific locations, such as universities, school districts, and governmental agencies. Tests can be administered on one computer, a number of computers (networked or independent), or even from a USB flash drive. 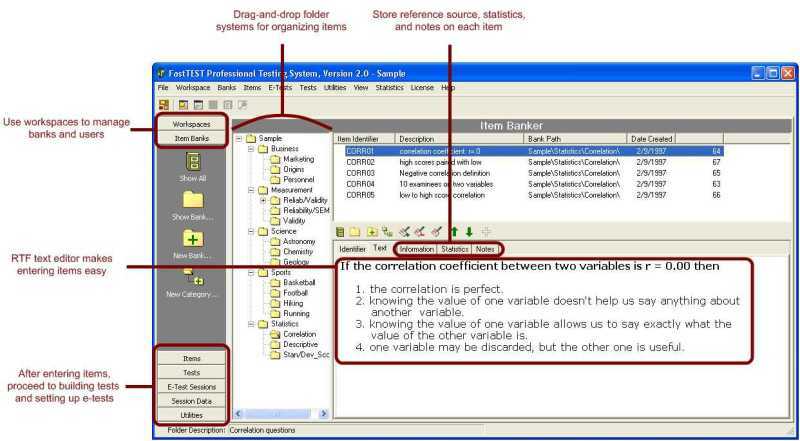 With its capability of delivering computerized adaptive tests (CATs) based on item response theory, combined with a host of other advanced features, FastTEST Pro 2.3 is the most sophisticated Windows-based testing system available. Data logging: When building a test session for delivery, there is now an option to have examinee response data immediately logged to a text file, one line per examinee. Item timing: FastTEST Pro now allows you to implement a maximum time for each item. Score free-response items: FastTEST Pro now allows you to immediately score free-response items by assigning score values (e.g., 1) to a list of responses that you create. Item scores can be different for each correct answer that you specify. Special items report: The Special Items Report is designed for a proctor to view an examinee’s responses to selected responses to selected items in a test following its completion. Score conversion module: The Score Conversion Module allows you to take any score from any module prior to it in a Test Session and convert via percentiles, classifications, or a linear transformation. The converted scores can then be used in Custom Reports. Data extraction from Master Data Files: FastTEST Pro can aggregate your data files from a session into a Master Data File for any number of testing stations and prepare the data that you select for analysis. Module timing: Timing can now be implemented on specific modules in a test session and turned off for other modules. Continuous item numbering: If a test session contains more than one module with items, the numbering sequence displayed to candidates can now be linked to be continuous. Test Administration Options:In addition to selecting a Test Session for each examinee, you can now administer tests in Session Mode and Continuous Mode.